At least an hour before you plan to cook it and up to 24 hours in advance, generously salt and pepper the beef. If you're using kosher salt, it should form a thin crust on the outside of the meat like in the photo above. Place the meat uncovered on a rack set over a baking sheet in the refrigerator. Toss the cipollini onions in 2 tablespoons of olive oil, then put them in a single layer on a baking sheet and roast for 45 minutes at 375 degrees f. Toss the tomatoes and figs in 2 tablespoons of olive oil, and 1 tablespoon of balsamic vinegar. Salt and pepper, then add them to the roasted cipollini onions and continue roasting until the tomatoes and figs are soft and caramelized. As soon as the figs and tomatoes are in the oven, start the beef. Rub both sides of the beef with the vegetable oil. Heat a cast iron skillet or enameled cast iron pot over high heat until very hot. Place the beef on the hot cast iron pan and place a heavy pot or bowl filled with water on the beef to press it down. The weight prevents the meat from curling and helps the beef get a nice even brown crust. Once you have a brown crust on one side, flip the beef over and brown the other side, applying the weight again. Once both sides are browned, place the pan in the oven along with the roasting vegetables. Roast the tri tip until an instant read thermometer reads the temperature you want it (130 degrees F for medium rare). Remove the beef from the oven and transfer it to a cutting board. Allow the beef to rest for 15 minutes, so the juices don't all run out and make your meat dry. 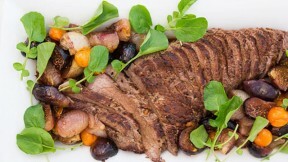 Once the beef has had a chance to rest, slice it thinly against the grain and serve it with the roasted vegetables and watercress.